The Dow traversed a rough holiday-shortened week, marked by the return of trade war fears. Trade tensions dissipated on Monday following the temporary ceasefire between the United States and China. However, trade fears made a comeback on the next day following U.S. President Donald Trump’s “Tariff Man” tweets. A yield curve inversion also weighed on investors, sparking fears of an economic slowdown. The Dow increased 0.8% on investors’ hopes of a possible truce in the eight-month long trade conflict between the United States and China. Trump and Chinese President Xi Jinping met for dinner on the sidelines of the G-20 summit in Argentina on Dec 1. The index gained 5.2% last week, its highest weekly gain since November 2016. Positive comments from the United States and Chinese officials about a possible solution to trade-related conflicts perked up investors. Fed chair Jerome Powell’s comment that key interest rates are close to neutral level also bodes well for investors. A series of key economic reports also motivated investors to turn to risky assets like equities. For the month of November, the index gained 1.7%. Wall Street gained significantly in the first week of the month on midterm Congressional election results. Markets took a severe nosedive in the second and third weeks owing to a plunge in crude oil prices. However, last week, Wall Street made a smart comeback. The index gained 1.1% on Monday following a pause in trade-related hostilities between the United States and China. Following Trump and Jinping’s dinner meet, the countries agreed on a 90-day truce to address bilateral trade-related issues. The index plunged 3.1% on Tuesday, reversing its two-day winning streak. Yields on 2-Year US Treasury Note and 3-Year US Treasury Note surpassed the yield on 5-Year US Treasury Note. For many industry experts, this is a clear signal of an impending economic slowdown. Moreover, investors become skeptical regarding a permanent solution to the trade conflicts. Such fears heightened after Trump reminded China that tariffs are still a key weapon for him. Meanwhile, Wall Street was closed on Wednesday to mourn former President George H.W. Bush. The index fell 0.3% on Thursday, shedding 785 points at its session low. News that Huawei’s chief financial officer had been arrested for violating Iran sanctions triggered renewed concerns about U.S.-China trade ties. However, markets were able to recoup initial losses somewhat with an afternoon rebound helping the Dow enter the positive zone for the year. The recovery was triggered by a report from the Wall Street Journal per which the Fed may take a break from raising rates after announcing a hike later this month. Apple Inc. AAPL is expected to wait until 2020 to unveil an iPhone with 5G connectivity, per Bloomberg. The Cupertino-based company, which initially planned to launch a 5G-supported iPhone by 2019, is likely to delay the launch due to unavailability of Intel’s INTC 5G-enabled chips. Notably, after a legal dispute over royalty payments with Qualcomm QCOM, Zacks Rank #3 (Hold) Apple chose Intel’s 5G chips for its iPhones. DowDuPont Inc.’s DWDP subsidiary, The Dow Chemical Company, has announced that it is making a series of investments in methyl cellulose capacity expansion. The move will help customers of construction dry mix to secure a reliable supply of key additives. These capacity expansions also demonstrate the company’s commitment to the dry mix industry. DowDuPont has a Zacks Rank #3. Exxon Mobil Corporation XOM continues to gain from holding some of the most prolific upstream global assets, particularly the Stabroek Block. The asset’s exploration potential was ascertained with the 10th discovery at the Pluma-1 well, offshore Guyana. With the recent finding, the combined gross recoverable resources have been increased to more than 5 billion oil-equivalent barrels from the prior projection of more than 4 billion oil-equivalent barrels. Pluma-1 well is the sixth find on the Stabroek Block in the past year. Located about 17 miles south of the Turbot-1 well, it encountered about 121 feet (37 meters) of superior, hydrocarbon-bearing sandstone reservoir. The drilling of the well commenced on Nov 1, 2018, wherein the Noble Tom Madden drillship was used to reach a total depth of 16,447 feet (5,013 meters) in 3,340 feet (1,018 meters) of water. Subsequently, the Noble Tom Madden will drill the Tilapia-1 prospect located 3.4 miles (5.5 kilometers) west of the Longtail-1 well. The stock has a Zacks Rank #3. You can see the complete list of today’s Zacks #1 Rank (Strong Buy) stocks here. Johnson & Johnson JNJ presented positive data from late-stage label expansion studies evaluating its blood cancer drugs, Imbruvica and Darzalex, in previously untreated patients at the annual meeting of the American Society of Hematology (ASH) held in San Diego, CA. Verizon Communications Inc. VZ announced plans to launch commercial 5G smartphones in the market in first-half 2019 in collaboration with electronics firm Samsung. This offers a clear-cut edge to Zacks Rank #3 Verizon as one of its closest competitors — Apple — reportedly aims to bring in 5G phones in 2020. Verizon had launched the world’s first commercial 5G broadband Internet service in select markets on Oct 1, 2018. Dubbed Verizon 5G Home, the service was initially made available in select regions in Houston, Indianapolis, Los Angeles and Sacramento. Procter & Gamble Company PG, commonly known as P&G, completed its previously announced acquisition of the consumer-health business of Germany-based Merck KGaA. Procter & Gamble stock has a Zacks Rank #3. 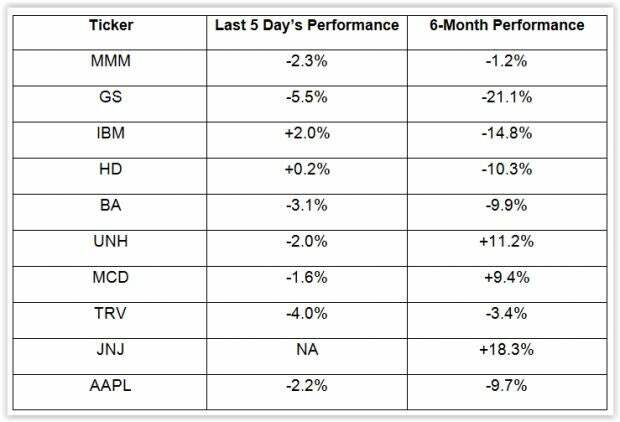 The table given below shows the price movement of the 10 largest components of the Dow, which is a price weighted index, over the last five days and during the last six months. Over the past five trading days, the Dow has plunged 3.4%. After a breather, markets are again confronted by trade-related fears. This is likely to be a recurrent worry for investors despite the recent truce. Meanwhile, investors are beginning to come to terms with a yield curve inversion, which signals an impending economic slowdown. Clearly, investors will have to brace for more market turbulence in the days ahead.